I’m taking another look back at some of my fragrances, and found this classic, Vera Wang For Men. This one was released in 2004, but I didn’t actually get this until around 2006-07, when it was gaining and gaining in popularity. As you can see I actually have two bottles, I got a large bottle, then a smaller one as a gift, so I’ve ended up with two. Along with One Million, this is another one of those scents which so many other lads made their signature scent, and if you’ve had a small, you’ll know why. The fragrance is really nice! It’s inviting and a very pleasant scent. I don’t think it has that absolute stand out smell about it, but it’s quite seductive, and a one which any lady will like. It’s similar in colour to Dolce And Gabbana The One, and a similar style of scent too. This is less woody, and you can smell the green citrus coming through, especially at the opening. It hasn’t lost it’s essence as being a really nice option, but there’s been so many new fragrances which have been released in those 13 years, it’s no longer as highly regarded as it once was. The good news is that it’s no longer very expensive any more. If you don’t own this, or previous have, you should definitely pick up a bottle. You should be able to get a 100ml bottle for under £30, which will last for a very long time, even if you use it everyday, and it’s really good value. If it’s a favourite then you’ll want to get a bottle too, because as we know aftershaves can go discontinued and once they are, it’s hard and then impossible to get another bottle. Speaking of the bottle, it’s a no nonsense bottle in clear glass, with the branding in a tasteful style to the front. The top is faux wood, signifying the woody nature of the scent. Longevity – Vera Wang lasts a reasonable amount of time. It’s an EDT, but because of it’s woody nature, it lasts 4-6 hours. Projection – There is a good amount of projection without it being over powering. It’s noticeable, projects well without being offensive. The best news about this scent is the price. You can pick it up at Amazon for less than £20 right now! Buy or check the latest price here. If you own this scent already, let me know what you think. As always, you can check all my fragrance reviews if you’re on the hunt for a brand new scent, or just want to discover something else. Wet Shave vs Dry Shave – Which Is Better? 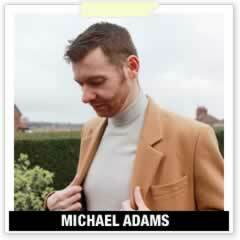 Michael Adams is the founder and editor of Michael 84, blogger and T-shirt designer from Newcastle, UK. Sharing men's fashion tips, style advice and lifestyle information for all guys.